Putnam County’s Tourism Bureau came under attack Tuesday evening when members of the county Legislature’s Economic Development Committee reviewed the agency’s requested budget for 2016. Lawmakers are reviewing County Executive Mary… Please login below or purchase a subscription to the Putnam County Courier to access this content. Sakima Brown The 2016 elections are more than a year away yet a Poughkeepsie woman and graduate of West Point announced Tuesday her intention to challenge Representative Sean Patrick Maloney for the 18th Congressional District seat. Sakima Brown hope… Please login below or purchase a subscription to the Putnam County Courier to access this content. Forty five Southeast residents using Brewster Village water will be receiving unwanted tax bills in the mail advising of an $800 increase in water rates for 2016. The Brewster Village Board voted last week to increase the tariff in order to pay for … Please login below or purchase a subscription to the Putnam County Courier to access this content. Michael Barile addresses the Carmel Town Board. 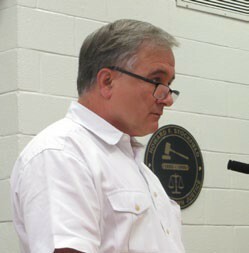 Anger, shock as well as sadness continue to permeate greater Mahopac this week following allegations that a member of the Mahopac Fire Department reportedly embezzled millions of taxpayer dollars from t… Please login below or purchase a subscription to the Putnam County Courier to access this content. 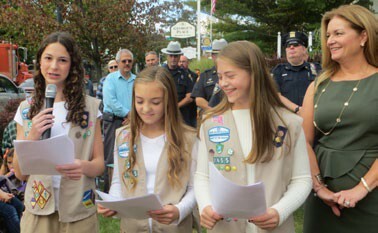 Gianna Nardini delivers remarks at last week’s opening ceremony while her fellow scouts Ashley Leftwich and Alexandra Baranowski along with County Executive MaryEllen Odell look on. Putnam County’s First Responders Garden has opened in do… Please login below or purchase a subscription to the Putnam County Courier to access this content. 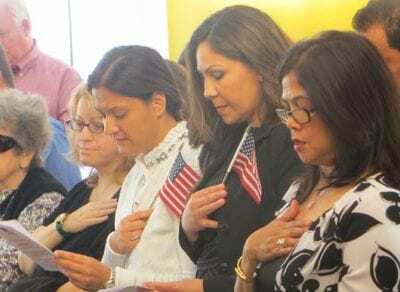 Above: The oath of allegiance is administered to the new citizens. Left: Edith Giustino and her daughter Helen rejoice following the ceremony. Inset:A sheet cake congratulates the new citizens. Vietnam veteran and Silver Star recipient Karl Rohde sum… Please login below or purchase a subscription to the Putnam County Courier to access this content. The Chapel Restoration presents a medley of the most beautiful art songs from Argentina, Iceland and Ukraine, with several from Brahms, at The Chapel Restoration on Sunday, October 18, at 4. Admission is free. The program features mezzo soprano Chri… Please login below or purchase a subscription to the Putnam County Courier to access this content. 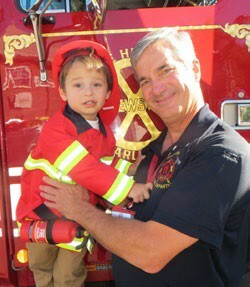 Putnam Family and Community Services (PFCS) annual benefit takes place Friday when Imagine: Life Lived to the Fullest takes place at the Salem Golf Club in North Salem. PFCS Executive Director Diane Russo said the affair will celebrate another year … Please login below or purchase a subscription to the Putnam County Courier to access this content. Krav Maga New York, trainers for New York Tactical Officers Association and Tactical Operators East, has launched a “See Something – Do Something” campaign to teach as many people as possible how to defend themselves. In cooperation wit… Please login below or purchase a subscription to the Putnam County Courier to access this content.